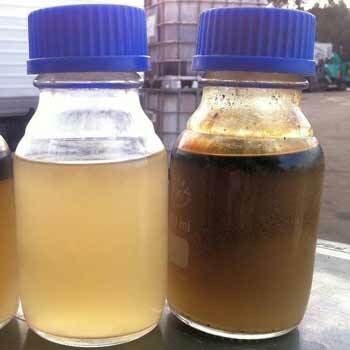 Oil droplet size is a critical factor in the separation of oil and water. The larger the oil droplets, the easier they are to remove, the smaller they are, the harder they are to remove. 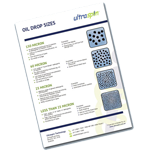 The size of the oil droplets will determine which oily water separator types will work for your particular application. So how can you find out how big your droplets are? Why do you need to determine your oil droplet size? Different oil/water separation technologies have different cut-off sizes for the smallest oil droplets they can remove, so knowing the oil droplet size is essential when deciding which type of separator to buy. For instance, Ultraspin hydrocyclones can handle oil droplets as small as 10 microns in size (be aware of claims by other vendors though, not all hydrocyclones are created equal) while gravity systems like plate packs and SPEL work on droplets 60 microns or larger. 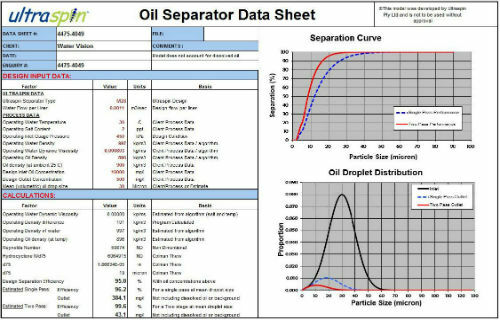 A performance curve will tell you exactly how well a system removes different size oil droplets, so you should always request one from any vendors and compare it to your droplet size before making a separator purchase. How we measure droplet size at Ultraspin? At Ultraspin we’ve spent years and a lot of money trying all sorts of different anlysers and our current one is certainly the best we’ve ever used. In our experience, the best way to measure oil droplet size is with a Video Particle Analyser. Ultraspin’s particle analyser is manufactured by Jorin. The water sample flows under a microscope connected to a high speed video camera. Powerful image analysis software looks at the images, and uses unique algorithms to distinguish between oil droplets, dirt particles, and other contaminants in the water. The size and shape of thousands of droplets are measured in real time as they flow past the lens, providing incredibly rapid and accurate measurements of oil droplet size. How you can measure your droplet size? Video Particle Analysers are the most accurate method of analysis available, but they’re expensive and you may not have access to one. You can still get a rough estimate with just a bottle, a ruler and a stopwatch. A mathematical formula called Stoke’s Law links the size of oil droplets to their speed as they float to the surface. By letting a bottle of oily water sit, and measuring how fast it takes for the droplets to rise you can get a rough estimate of their size. If your application isn’t listed, contact us and we can look up previous data from your industry.